After almost three months, ESB Networks and ESB International have repaired the undersea cable fault located about 2km off the coast of Inis Mór, restoring mains electricity supply to Inis Meáin and Inis Oírr using world-first in-house technology. A 26-strong project team have been based on Inis Mór for the past seven weeks. The cable was energised from Inis Mór on Friday, and an intense period of rigorous testing followed over the weekend. “All three Aran Islands lost supply on Friday August 5 and while power was restored to Inis Mór within hours, a huge effort was required to transport and activate generators and transformers on Inis Oírr over that weekend, restoring power to the two islands on Monday. “Meanwhile, ESB Networks and ESB International crews began intensive underwater investigation, using electrical surges to pinpoint the exact fault position along the 10.5km cable in early October, located at 20 metres depth. ESB International Managing Director Ollie Brogan explained the cutting edge technique that was used to complete the repair. “The traditional method of repairing a subsea cable would be to haul the cable onto a barge or ship and make the repair on the deck of the ship. “However, in this case trained divers accessed the faulty part of the cable through a pressurised habitat, mounted around the cable. 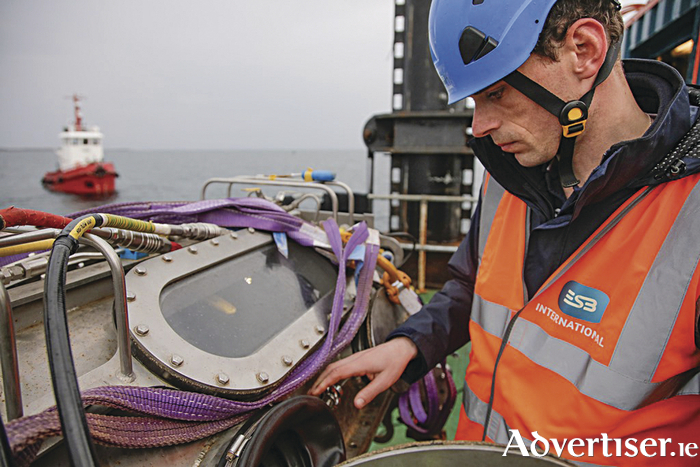 The habitat is a world first, used in 2014 for the first time to successfully repair the Moyle Interconnector in situ on the sea bed. Page generated in 0.1889 seconds.